The White Wonder Studios logo has grown into something fairly straight-forward. The snowflake design quickly conveys what “White Wonder” means, and the circle and swirl in the center is our original logo. The original logo was the result of abstract work – mainly playing with and transforming geometric shapes. When Isaiah created our signature swirl, it really resonated with him, and thus our logo was born. While on his journey to the bottom of the world, Isaiah spent a lot of time in New Zealand. While there, he came across a Māori (native people of New Zealand) bone carving necklace that bears a striking resemblance to our already-existing logo. The symbol in the carving was that of the double-koru. The resemblance is uncanny. Not believing in chance or coincidence, Isaiah bought the necklace and still owns it to this day. Koru is the Māori word for spiral, and is based on the shape of an unfurling fern frong. 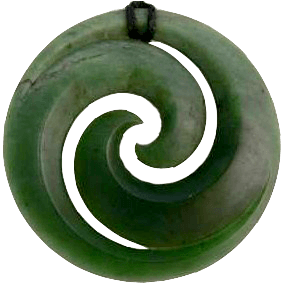 The koru is seen by the Māori as a symbol of creation – bringing new life, growth, new beginnings, and purity into the world. It also represents strength, peace, tranquility, and spirituality. The circular shape of the double-koru represents the idea of perpetual movement, with the inward coil symbolizing a return to the point of origin. The two unfolding fern fronds represent leaving the protective circle of home, reaching outward toward life and new growth. The symbolism is representative of the life cycle. Let’s be honest for a second – this website is a lot like so many others on the web. It’s responsive web design, works on all browsers and operating systems, uses the latest standards in HTML, CSS, PHP, MySQL, jQuery, etc. etc. We could go on. It’s a solid framework which is why so many companies harness the same technologies to design their website. The difference lies in the story behind the design. Antarctica is a part of our namesake, so we wanted to incorporate that into the design. To make the screen feel like an open, wide expanse – we used photos from Antarctica for some of the backgrounds, making generous use of white space (all the photos were taken by Isaiah while he worked in Antarctica). The colors are a white, black, gray, and ice blue palette – matching the colors found down at the bottom of the world.